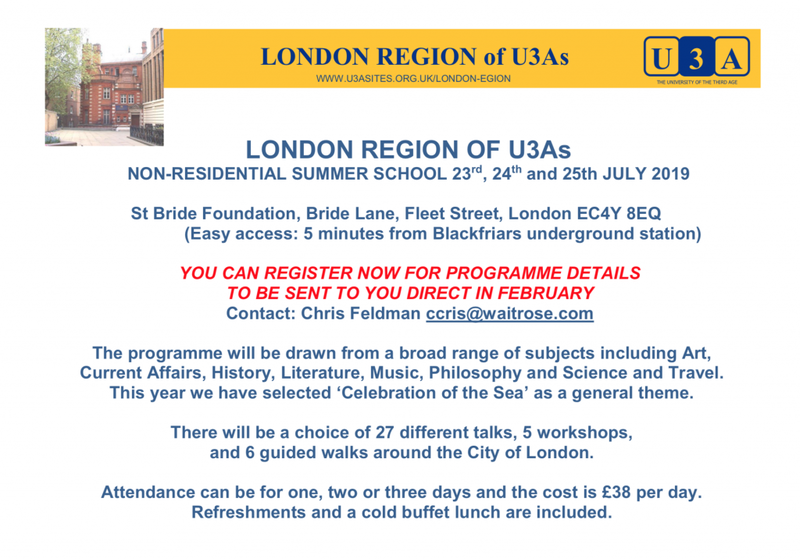 The U3A London Region Summer School 2019 on Tuesday 23rd to Thursday 25th July at St Bride Foundation, Bride Lane, Fleet Street. This is the popular annual non-residential event. Members can choose to attend for one, two or three days. There will be a wide range of subjects on the themes of Art, Current Affairs, History, Literature, Music, Science and Travel, a choice of 27 different talks, 5 workshops, and 6 guided walks around the City of London. This year, we are including some talks which will explore the theme of Celebration of the Sea.